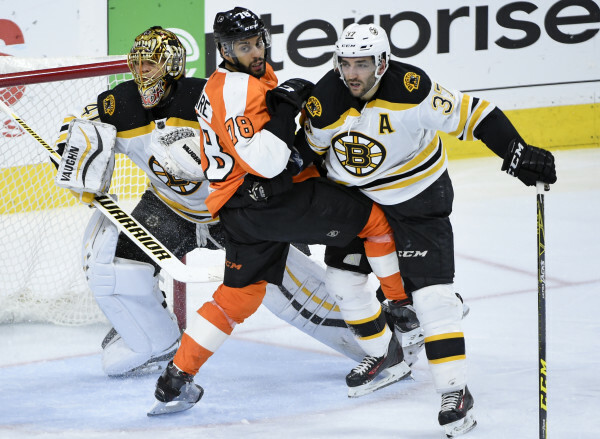 Philadelphia Flyers right wing Pierre-Edouard Bellemare (78) battles with Boston Bruins center Patrice Bergeron (37) in front of goalie Tuukka Rask during the third period Monday night at the Wells Fargo Center. The Burins won 3-2. PHILADELPHIA — This time, the Boston Bruins survived a Philadelphia Flyers comeback with a 3-2 win on Monday night at the Wells Fargo Center. After twice blowing third-period leads for a pair of losses to Philadelphia this season, Boston coughed up another advantage but escaped when right winger Brett Connolly deflected a shot into the net with 1:54 left in regulation for the game-winning goal. The Bruins (26-17-5) have won five of their last six games since falling to the Flyers on Jan. 13 and hold one of the two Eastern Conference wild-card spots with one game left before the All-Star break. Boston killed off a Philadelphia power play to seal the win. The Flyers (20-18-8) have dropped three in a row and four of five since that victory, slipping to seventh place in the Metropolitan Division. With Philadelphia trailing 2-0, right winger Wayne Simmonds scored two goals to tie it — one in the second period, the other in the third at 12:08. But Bruins goaltender Tuukka Rask (17-14-4) was strong, making 34 saves and improving to 10-2-2 lifetime against the Flyers. Philadelphia goaltender Michal Neuvirth (10-6-2) played in just his second game since Jan. 5 and stopped 28 shots. The Bruins used their second-ranked power play to jump the Flyers in the first period. It took just 5:04 for Boston to strike first when centers Ryan Spooner and Patrice Bergeron got into the slot and connected for a 1-0 lead on the man-advantage. Spooner delivered a short pass to Bergeron, who simply guided the puck past a recovering Neuvirth. It was Bergeron’s 19th goal and Spooner’s 26th assist. With 2:33 left in the opening period, the Bruins went on the power play again and capitalized as left winger Brad Marchand went top shelf from one knee to supply Boston a 2-0 cushion. Defenseman Zdeno Chara facilitated Marchand’s fifth goal in as many games by slicing the Philadelphia defense with a cross-ice pass. After a big first period, the Bruins shot themselves in the foot during the second by committing four penalties. However, Boston withstood Philadelphia’s persistent attack, killing off three of the four power plays despite being outshot 15-6 over the stanza. The Flyers chopped into the Bruins’ lead on their second man-advantage. A tricky rebound was corralled by center Brayden Schenn, who impressively fed right winger Wayne Simmonds across the goal crease to bring Philadelphia within one. Defenseman Shayne Gostisbehere collected an assist on the marker, giving him 20 points this season, most among NHL rookie defenseman. Rask made a number of difficult saves to keep Boston above water at second intermission.